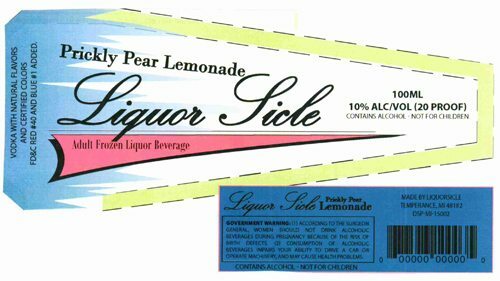 This Liquor Sicle label features a prominent reference to “Liquor.” This has become rare. Where did the term come from, and where did it go? early 13c., likur “any matter in a liquid state,” from O.Fr. licour, from L. liquorem (nom. liquor) “liquid, liquidity,” from liquere “be fluid.” Sense of “fermented or distilled drink” (especially wine) first recorded c.1300. To liquor up “get drunk” is from 1845. It is semi-ironic that this term is being applied to one of the few TTB products that is not intended to be consumed in a “liquid state.” From way back in 1892, here is a court struggling with the term, and trying to find the distinction between beer and liquor. In a further irony, the term is probably used more commonly, these days, on malt beverages (such as Colt 45) compared to distilled spirits. “Malt liquor” goes back to at least 1937, and Alvin Gluek secured a patent on it in 1948. I invented liquor sicle and really am happy to see a picture of my product on the net. I would love to get these on the market. Does anyone have any suggestions? sexual processing music-booze-society political type trademarks-beverage litigation legally interesting/controversial famous therapeutic business strategy procedure statement of composition would you drink it? formulas history brand extensions media buzz container sin narrowed demographic APTs speaks for itself risqué caffeine/secondary effects hybrid policy writing/witty/funny organic/vegan/green serving facts/allergens fda origin drinkwire craft ingredients design non-liquid rejections international speech current events unlikely combinations dairy functional would you approve it?